It’s orange. It’s blue. It’s sock yarn and it’s been in my stash for years. I remember buying it way back when in 2009, folks. At the time, I wasn’t worried about how the colors would knit up because this yarn was going to socks. Simple socks too. Whether they were ribbed or plain stockinette, it didn’t matter if the colors pooled or flashed or did any other strange things. Skip forward 4 years to 2013 and the yarn that would be socks is going to be a shawl instead. That changes things a bit. Suddenly, how the colors knit up matters a lot. Pooling and flashing are things to be avoided at all costs. What exactly is pooling and flashing? Pooling is when colors clump together and knit up into big splotches, AKA pools or puddles, of color. Flashing is similar to pooling in that colors clump but will stripe and move around like a bolt of lightening in your knitting. So, I swatched the yarn by casting on for a top down shawl just to see what the colors would do. Once I got a few rows into the pattern, there was pooling and puddling. Puddles so big you’d have to jump across them if you found them in a parking lot. Even then, you’d probably still end up in ankle deep water. So, I ripped out the shawl and started experimenting with different and easy ways to mess with the color repeats. 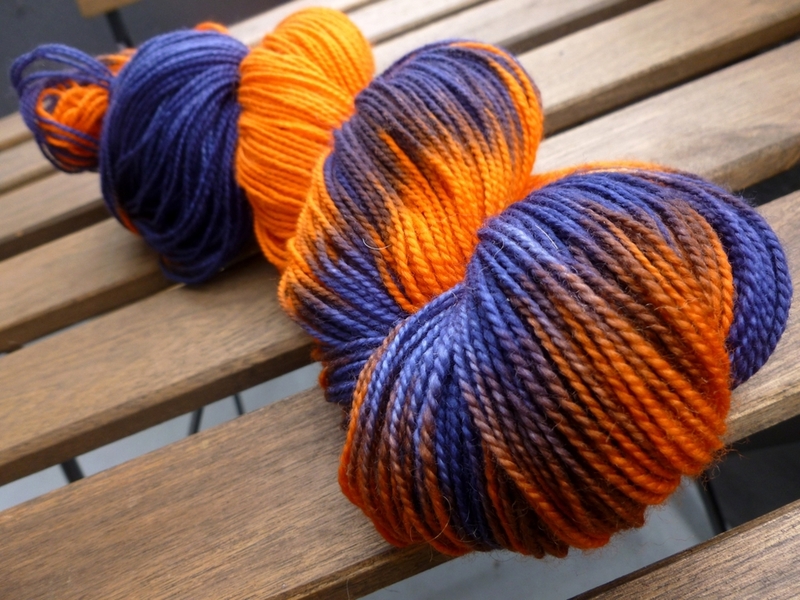 The variegated yarn I’m using, Kaleidoscope, was dyed by Blue Ridge Yarns and has the very appropriate color name of ‘War Eagle’. 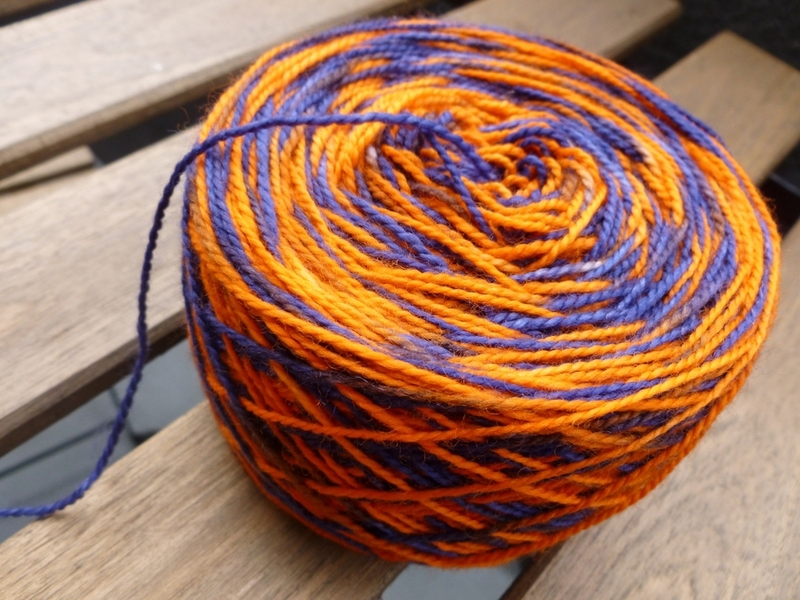 Most of the skein is dyed with short repeats of orange and blue where each color is 3” - 4”. Then there is a long section where each color is 12” long. 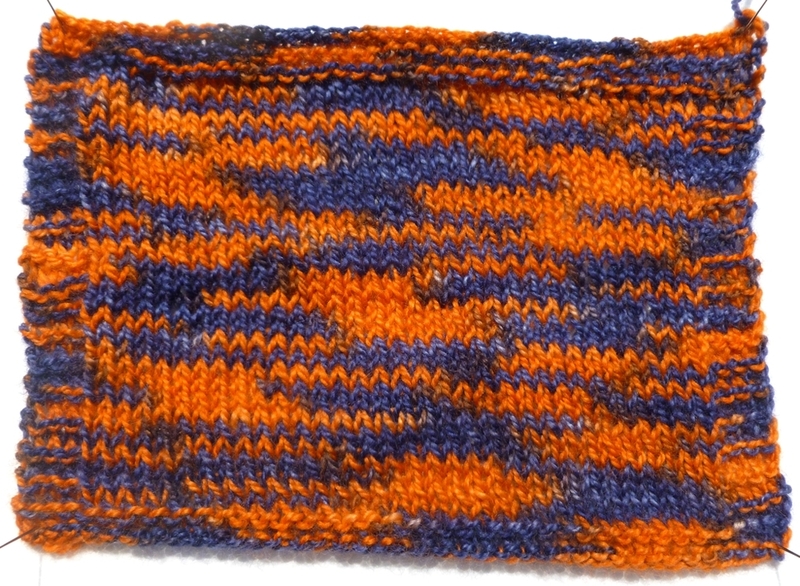 The first swatch and two other swatches were knit using the pattern below. Needle size was also the same except for the third swatch. Cast on 40 stitches with the long tail cast on. Knit 4 rows of garter. Knit 30 rows of stockinette. Knit 4 more rows of garter and bind off. The first swatch, knit on 2.75 mm needles, was knit to establish a baseline. It’s important to know how the yarn knits up if left to its own devices. Both colors make little pools but are interrupted by the longer sections of color. Certainly doesn’t look bad but what it doesn’t work for your project? First option, stripes. Instead of knitting with one of the skein for the entire project, knit 2 rows with one end and 2 rows with the opposite end. If you have more than one ball of yarn, knit 2 rows with one ball and 2 rows with another ball. If the project is worked in the round, there’s one more option that is rather fiddly when knitting flat. Alternate the working yarn every row. You won’t have to worry about jogs or any of the other tell-tale signs of stripes since you’re working with the same colors. Switching the ends every 2 rows didn’t really work for this swatch since it created a textbook example of flashing; exactly what I’m trying to avoid. There is another option though. 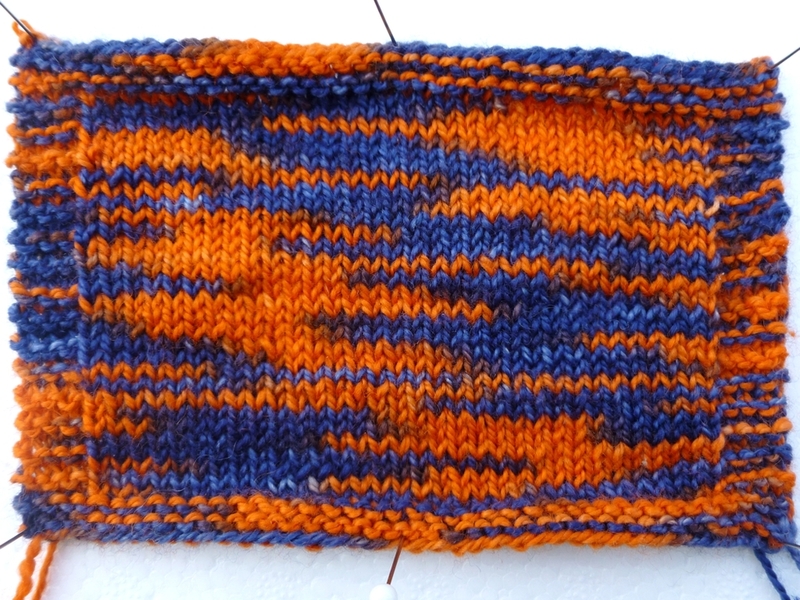 The third way to affect color in knitting: change the gauge. This last swatch is knit the same as the first but at a much larger gauge on 4mm needles. There’s a little pooling and a flashing but neither dominates the knitting. They kind of meld together to make a more cohesive whole. Just be aware that changing the gauge might not always work for a project. 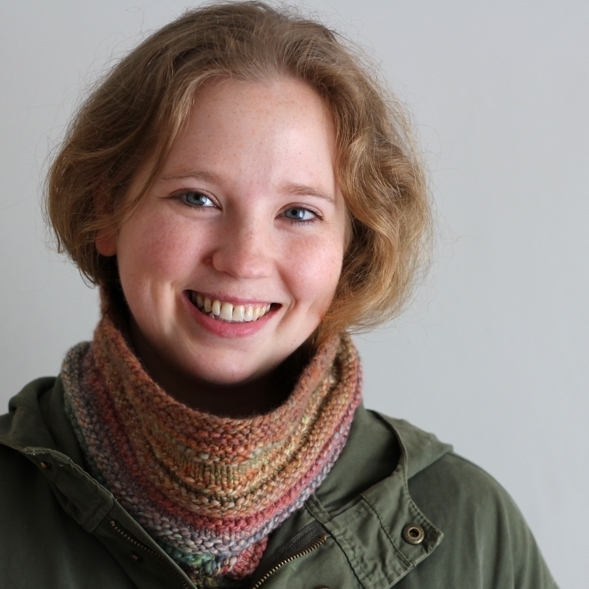 You could get away with adding 2 extra stitches per row to a garter stitch scarf. Adding or subtracting 2 extra stitches per 4” on a sweater is a recipe for disaster. So, if you like how a yarn knits up at a certain gauge don’t try to force the yarn and an incompatible pattern together. Find a different pattern that matches your preferred gauge and make something you truly enjoy. The easiest options for combatting pooling and flashing in knitting are alternating the yarn ends every 1 or 2 rows and changing the gauge. All yarn is different, especially hand dyed yarn, and the only way to figure out the best option is to swatch. See what happens, experiment, and have a little fun with it. Don’t think of swatching as wasted knitting time. Swatching is like meeting someone new for coffee before going on a week long camping trip with them. There are some things you just need to know first.